Over the last month and a half, our basement suite has been a work in progress with contractors coming and going, making lots of noise and eventually banishing us to our own corner of the house. As was the case with the painters! One morning both our bedroom and bathroom doors had been covered with plastic and we couldn’t get out! So we crawled out through our window and into the back yard to get to work. Fantastic, no? With the framing, drywall, mudding and finally painting complete (you should see the gorgeous sage green on the walls! ), it’s all downhill from here! Currently we have some fancy pressed cement being laid that will eventually look like stone. Then, the carpeters come and we will have a living room at last! We are anxious to finally own a couch. In the meantime, Ginger has been trapped with us in our corner of the house while the workers and associated smells dissipate. A free spirit, she is always anxious to roam about, though we need to make sure she does her business in the right place as she has been known to leave deposits in unwelcome places… So! Our new rule is once she has used her litter box in the morning, she can roam freely. Some days it may take hours before she’ll get around to it. As was the case yesterday. Ginger and I spent the day in our room, with her scrambling to escape every time we opened the door, to climbing to the top of the closet to lounging on the bed with me, while her litter box remained empty. We have been rather conscientious to not leave her in the bedroom alone as we have found unwanted deposits on our bed. I ran out to pick up Tim (who has started back to school again, which is entirely its own post!) and got distracted by old episodes of 24 when we returned. When I went to get the laptop, I found she had left several unwelcome presents for us on Tim’s side of the bed. I was calling her in my angry voice as I cleaned up and subsequently called Tim to the scene. When we looked for her, she was nowhere to be found — not under the bed, in the shower, under the dressers or anywhere in the closet. 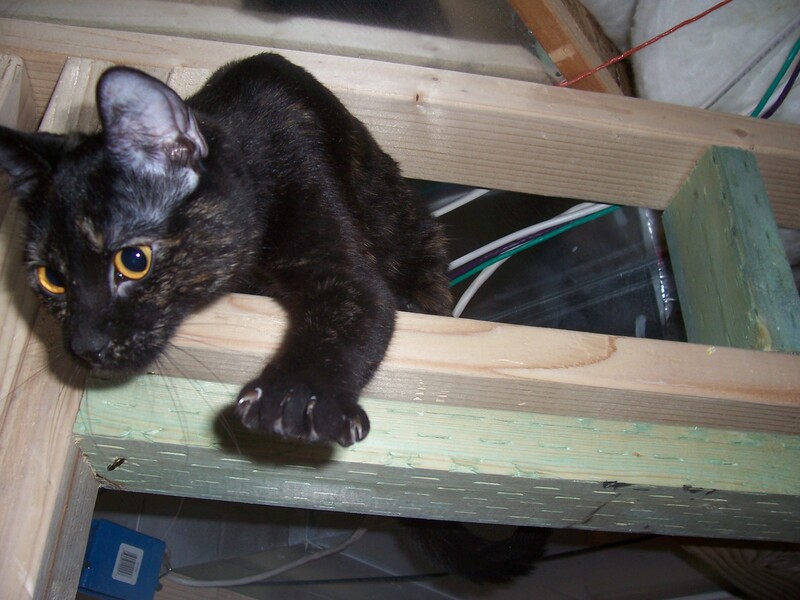 Tim finally discovered that the 3″ the window had been opened was enough space for her to nudge the screen open and escape into the night. Now Ginger is an indoor cat for many reasons. 1. Utah roadkill. ‘Nuff said. 2. She is not yet fixed (I dream of kittens though Tim would beg to differ). 3. Being in a developing area, there are wild coyotes that surely lurk in the night. Having had lost cat #1, Victor, to the mercy of a coyote, it will not happen again. 4. Liberty, cat #2, was wild and fun and entertaining… up until we let her become an outside cat. Now she lives at other people’s houses, sleeps all day and is relatively dry in comparison. Luckily, she didn’t go far and with the recent snowfall on the ground, all we would have had to do was follow her little paw prints. We found her in the back yard, huddled close to the house, still warm from being inside minutes ago. When we brought her back into our bedroom, she made a mad dash for the window. 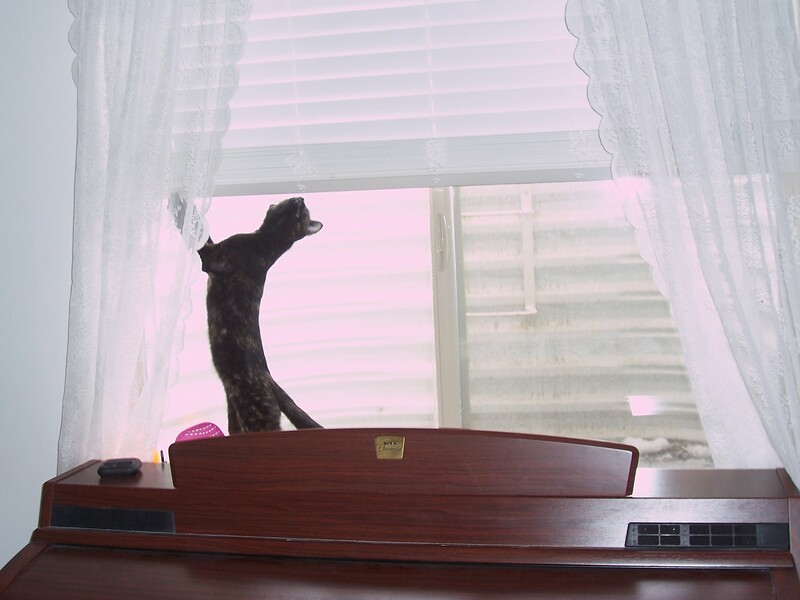 Since then, the window has been her newest fascination as her little feline mind tries to wrap itself around how it is done, now that she’s had a taste of freedom. What would life be like without Ginger?